Door County is a beautiful place to visit, and it is especially beautiful by horse! 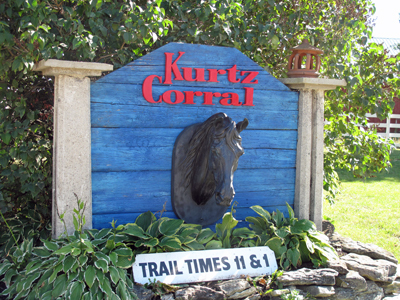 From arena rides, to wooded trail rides, Kurtz Corral is one terrific find in Door County if you like nature, horses, and fun! Step into the Old West and have a blast! This place is something very special! You will enjoy, no matter waht skill level you are! This is the premiere riding stable in Door County - they do it right on about 500 acres of trails! Family run since about 1961, Kurtz Corral stables about 52 horses, and not only offers rides, but lessons as well for all levels. This place is really for all ages and abilities - read on! Safety is always first, and at Kurtz Corral, they will ask you to fill out a questionnaire and release form, to determine your experience level. Then you watch a video on riding safety, select a helmet (boots are available to select too), then you head out to the corral where further instruction is given, and your finally mount your horse. Open year round (limited hours in the off-season), Kurtz Corral has something to offer for all ages and experience. If you are an experienced rider (40+ hours of riding), for example, there is an “Advanced Trail Ride” where you walk, trot and canter on a two hour ride through the countryside. An option visit to a local winery if available too! Wow. One of our reviewer spent a couple of hours riding with Jim Kurtz, the owner, and loved every minute of it. Others from our team have ridden at Kurtz Corral many times, and have always enjoyed the experience. There guides are knowledgeable and professional, and the trails like a picture book! If you have a special event too, like a company outing, weddings, or special birthday, call Kurtz and they can arrange a spectacular ride! Take private or group lessons, in basic, intermediate or advanced categories. Kurtz also hosts some special events, like a New Year’s Eve ride – very cool! Located about 10 miles north of Sturgeon Bay on County Highway I (near Carlsville), Kurtz Corral will be one special find for you on your next trip to Door County! If you are heading north on Highway 42 at Carlsville, turn right, if heading south, turn left on County I. The corner of County I and Highway 42 has the Door Peninsula Winery and the Roadhouse as landmarks for you. After a mile or so you will see a small sign of a horse's head, and the entrance will be just beyond that a few 100 yards on the right. We have ridden horses at Kurtz Corral and have enjoyed ourselves! And we know you will have a lot of fun here too! Call ahead for reservations always! Walk-ins are welcomed, but reservations guarantees a spot at a time you want to ride. And make sure you make Kurtz Corral part of your next trip, and be sure to tell Jim and the staff that DoorCountyNavigator.com sent you - that helps us keep this site alive & well . . . for you! !